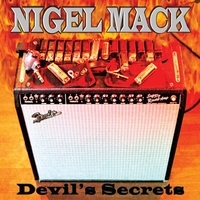 ’Devil’s Secrets’ is the highly anticipated all-original third release from triple blues threat Nigel Mack (vocals/harmonica/guitar), ‘Canada’s Blues Ambassador to Chicago’. ’Devil’s Secrets’ is the latest all-original release from ‘Canada’s Blues Ambassador to Chicago’. It was the #1 Canadian blues CD on Galaxie Satellite Blues Radio in Canada for 2012 and won the ‘Best Self-Produced CD’ award from the Windy City Blues Society, in Chicago. ‘King For A Day’, the CD’s kick-off track was a semi-finalist in the 2011 ‘International Songwriting Contest’. It is the third album by the blues 'triple-threat' (vocals/ harmonica/ guitar), following his two critically acclaimed CDs Road Rage and High Price To Play. ‘Devil’s Secrets’ features many different blues styles, from horn laden R&B and juke-joint harmonica instrumentals, to New Orleans funk and Chicago style blues. It chronicles Nigel move from Canada to Chicago, IL in 2003. An all-star cast of top musicians from both countries (including special guest CJ Chennier) reflects his years of touring as a bandleader and his dedication as a record producer. ‘Devil’s Secrets’ was tracked at Joyride Studios in Chicago, IL (with Grammy award-winning engineer Blaise Barton), Blue Wave studios in Vancouver, BC and was mixed by award-winning engineer Perry Barrett in Nashville TN. It is the third album produced by Nigel Mack, with a sharp eye toward high production values, while still embracing the honesty of the blues. Saskatoon native Nigel Mack vigorously worked his way across North America playing blues before settling into Chicago. Embraced by his new home town the Windy City Blues Society has dubbed the “Devils Secrets” best self produced CD. Nigel Mack has some enticing tricks up his sleeve with well written tunes and clever lyrics that feature his guitar, harmonica and vocals. Joining this blues dispel is the rhythm section of Vic Jackson on bass and Andrew “Blaze” Thomas on drums, Brian James covers the keys, Jr Wydra shares guitar licks and vocals with a horn section of Johnny Cotton on trombone, Victor Garcia on trumpet and Lise Gilly on sax. Mack has taken off the gloves and ready to rumble. Kicking off this blues revival with a blast of R&B horns and touch of New Orleans piano Mack shares his visions of grandeur with “King For A Day” his drawling muscular baritone laying a foundation of funk and his guitar weaves a sound worthy of King Freddy. The title tune has a deep plodding ominous tone with the slither of slide guitar whispering the “Devil's Secrets” as Mack confesses his weakness to temptation. A zydeco romp featuring C. J. Chenier on accordion, has the bass laying the underpinnings as Nigel 's harp floats around the upper register, he begs “Come Back Baby” then holds nothing back singing with passionate resolve as he declares he's gonna “Make You Love Me” while the horns swings and wail as Mack pleads to “Do It For A Change.” Nigel plays slide guitar on the dance able “Mid Life Crisis” folly trying to regain youthful pleasures and blows a mean harp on “Dead Presidents” (Don't Tell No Tales) as he testifies that cheating will catch up to you and the paper trail will lay you low. An instrumental lets all the players “Strut Your Stuff,” Nigel on harp leads the melody but lets the organ compliment the sound with the guitars getting the leads as well and “Meet Her Funk” may be his own tribute to the Meters.